A beautifully presented Bermudan cutter-rigged example of the Crabber 24, fitted out with the earlier teak finish with a warm internal feel and boasting the larger 2GM20 Yanmar diesel auxiliary engine option. 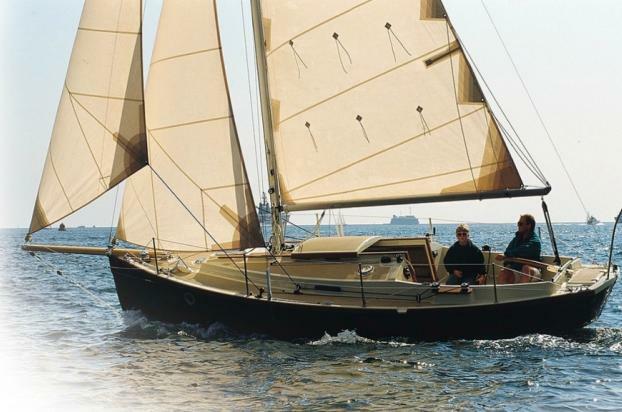 Simpler and better sailing, with less maintenance than in the case of the gaff rigged version, with their wooden spars, the bermudan version utilises aluminium alloy spars and this particular example has recently been re-outfitted with Selden reefing systems to both headstays for reliable sail handling too. The underwater sections of this Cutter 24 were epoxy-coated from new, with relatively 'dry' readings recorded in June 2017 and have been freshly anti-fouled for the 2018 season - she's just ready to go sailing in. unverified) Yankee Jib, all found to be in good serviceable condition, with 'no loose stitching or damage evident', in a June 2017 inspection. The sails have been checked and valeted during the winter 2017/18. Standing rigging is of 1x19 stainless steel wire and is of indeterminate age (thought probably to be of the same age as the vessel). A new cream-coloured stack pack style of mainsail cover delivered in January 2018 will be included in the sale. brought back to the cockpit. The Yanmar 2GM20 diesel is the bigger engine option that was offered by Cornish Crabbers and drives a fixed, three-bladed propeller through a conventional stainless steel shaft. A conventional packing-type seal is flexibly mounted to the inboard end of the sterntube and is remotely greased. No engine hour meter was provide by Yanmar at the time of installation. The surveyor's comments: "The engine paint coatings are in good cosmetic condition....with the general engine compartment space being well fitted.... the visual condition of the installation would suggest an adequate level of maintenance has been effected." The owner reports that with the current engine and propeller combination a speed of 6 knots is easily achievable. charged by the engine-mounted alternator when running. A rotary selector switch selects and isolates the batteries from a 12V DC distribution panel, fitted with individual circuit breakers. beneath the port seating main cabin. A maximum number of 5 berths is provided, but it is sensible to regard the Crabber 24's as '2+2' boats with flexibility as to where crew members sleep according to circumstance. 'Thomasina' was fitted with the raised 'Breton'-style berth forward providing a double berth in harbour, with two lower-level single berths - one to each side of the main seating area - most commonly used for seeping as well as seating about the removable table. A single quarter berth (to starboard side, abaft a chart table) offers a snug passage berth too. A forward facing chart table accommodates a hidden stainless steel sink within, opposite a simple but practical galley featuring a full two burner, grill and oven cooker; these areas both being amidships, while an enclosed heads compartment located conveniently close the companionway offers full privacy and the convenience of a marine flushing toilet. The original, removable cabin table has been supplemented by a second, smaller table for more convenient day-use. Externally, a relatively long cockpit, with deep coamings offers a full depth locker to port and a shallower tray locker to starboard (over the quarter berth), while two LPG canisters can be accommodated by the canister locker accessed from the stern deck. closure for a warm and tidy ambience. A protective and waterproof cover for the quarter berth to protect the head of the cushion when the chart table is being sat at has been ordered is being made as these details are being written. • Log and speed display by Navico. • Garmin GPS and plotter. • Suunto bulkhead-mounted steering compass. • ST 2000 tiller pilot (bigger option). • Anchorman, low profile manual windlass. • 25lbs plough main bower anchor. • Pushpit combining with transom-mounted boarding ladder to suit. • Double stainless steel guardwires carried within stainless steel stanchions. • Mid-ship mooring cleats in addition to two stern cleats and Sampson post forward. • Over-boom cockpit tent awning. • 2 off acrylic rope tidy bags for forward end of cockpit. • 2 off Camping Gaz butane canisters. • Outboard engine stowage pad to pushpit. • Aluminium, extendable boat hook. • 4 off cylindrical inflatable fenders. • 4 off ropes suitable for mooring. • Red ensign and staff. • Manual bilge pump operated from within the cockpit. • GMDSS and DSC capable Icom 58 VHF radio interfaced to GPS.